COLORADO SPRINGS, Co. — A number of Air Force cadets stationed at the U.S. Air Force Academy in Colorado have staged a ‘revolt’ against the recent erasure of Scripture from a white board outside of a cadet’s bedroom. According to reports, cadets at the academy and others who saw the handwritten Bible verse soon contacted the Washington-based Military Religious Freedom Foundation (MRFF) to lodge a complaint. After Weinstein’s organization contacted the academy to demand that the Scripture be removed, within hours, officials scrubbed the verse from the cadet’s board. 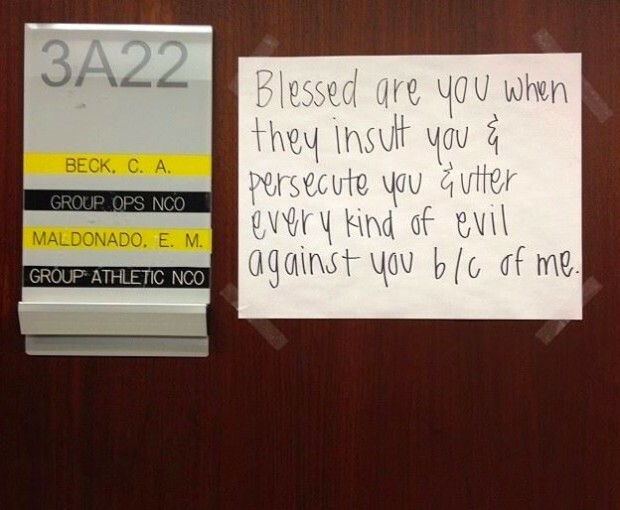 But after fellow cadets became aware that the Scripture had been erased, they decided to fight back by posting Bible verses outside of their own dorm rooms. “[A] population of the cadet wing has in turn responded with additional religious quotes placed outside their doors in the public hallways; one of which being the original quote that was removed,” read a letter from a complainant supplied to reporters by Weinstein. “Blessed are you when they insult you, and persecute you, and utter every kind of evil against you because of Me,” one sign read, quoting the words of Christ from Matthew 5:11. “[W]hatever is true, whatever is honorable, whatever is right, whatever is pure, whatever is lovely, whatever is of good repute, if there is any excellence and if anything worthy of praise, dwell on these things,” read another board from Philippians 4:8. Muslim cadets have also posted text from the Quaran to show support for the cadet’s right to post Scripture, according to reports. “The Air Force Academy has a revolt on their hands,” Weinstein told reporters on Wednesday. But the Liberty Institute, a Christian legal organization headquartered in Plano, Texas contends that it is unlawful for the academy to remove Scripture from the dorm doors of cadets, noting that it violates Department of Defense Instruction 1300.17, which protects religious freedom.